Here you will find several practical tips, e.g. about the spread of infections and carrying multiresistant bacteria, but also about your role as a partner of physicians and nurses or paramedical staff in your own care or the care provided to a relative or a friend. Talk to your care provider about hand hygiene. Encourage him/her to practise hand hygiene when necessary. You can also thank him/her when he/she is practising hand hygiene when providing care to you. How to communicate with my healthcare provider ? 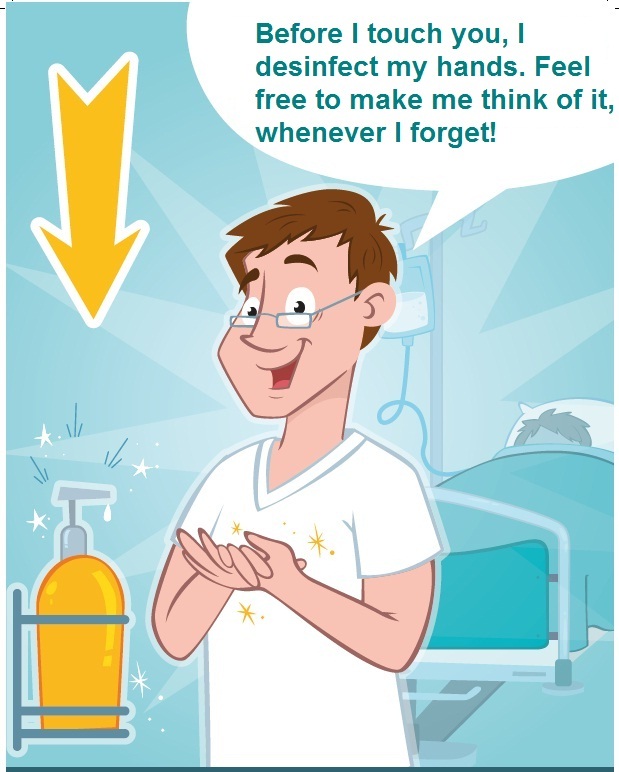 As a patient or relative/visitor, you can play an important role in the promotion of hand hygiene. By doing so, you become a partner of physicians, nurses and paramedics in your own care or that of your relative/friend. Indeed, hand hygiene is important in every kind of care, for every kind of healthcare worker (physician, nurse, paramedic,...) and in every kind of care setting (hospital, care centre, at the GP’s, at home,…). Clearly show your appreciation whenever physicians, nurses and paramedics disinfect their hands while providing care. If you think your healthcare provider has forgotten about it, kindly ask them if they have disinfected their hands. Before the healthcare provider approaches you, you can politely remind him/her of the importance of good hand hygiene. After body fluid exposure (e.g. emptying a urine bag). Relatives and visitors should wash or disinfect their hands when entering your room in the hospital (and especially before touching you), but also when they leave your room. If you address physicians, nurses and paramedics in a gentle and positive way about hand hygiene, they will understand your good intentions and they will not blame you. By means of the national campaign for the promotion of hand hygiene in Belgium, we stimulate healthcare providers to be open to any active contribution of the patient and his family to the care process. Besides, it is your right to ask information to healthcare providers and to check whether the best possible care is being given to you. What can I do as a patient ? DO NOT DO IT LIKE THIS ! Isn’t hand hygiene necessary before you start? You pig! Have I already reminded you of hand hygiene? Murderer! The nurse always disinfects her/his hands before touching me. You do that as well, don’t you doctor? (specific for addressing physicians) If I get a healthcare associated infection it will be your fault! Thank you for disinfecting your hands. I’ll tell your boss if you don’t disinfect your hand. I heard hand disinfection is necessary before a patient is touched. Is that correct? Do you do it too? I’ll tell the press if hand hygiene is not correctly applied here. Reminding and thanking are positive interactions. Your healthcare provider will understand your positive intentions to prevent an infection. Keep in simple and do it often! What can I do as a visitor to prevent infections ? Sanitize hands before and after visiting. The soap and hand sanitizer in patient rooms are for everyone. Wash or sanitize your hands when entering and leaving the room of the person you are visiting to avoid bringing in and carrying out germs. Insist that healthcare providers do the same before caring for your loved one. Clean your hands after sneezing, coughing, touching your eyes, nose, or mouth, after using the restroom, and before and after eating or drinking. Cover your cough or sneeze with your sleeve, and do not sit on patient beds or handle their equipment. Read and follow any instructions posted outside the patient’s room. Stay home if you are sick. Do not visit the hospital if you are sick or have had any ill symptoms within the last three days— including nausea, vomiting, diarrhea, fever (or feeling feverish), an uncontrolled cough, or a rash. Check first before you bring food, send flowers, or bring the kids. While flowers, young visitors, and home-baked goodies spread cheer, they may not be allowed. Always check first with the nurse on duty. Follow special precautions, if necessary. If the person you are visiting is on “isolation precautions,” talk to the nurse before entering the room to find out what steps you will have to take, such as wearing a mask or other protective clothing. Don’t contribute to the clutter. Limit the patient’s personal items. Less clutter eases the critical job of cleaning hospital rooms. Keep patient items off the floor and away from waste containers. What if I am a carrier of a multi-resistant bacteria myself ? Only a limited number of antibiotics can kill multi-resistant bacteria. That is why those bacteria can cause infections that are hard to treat. This makes it necessary to reduce their spreading throughout a healthcare institution. Do not hesitate to ask your healthcare providers for additional advice. The most important preventive measure is hand hygiene, for both patients and visitors. Inside the hospital, you always have to disinfect your hands with alcohol based solution. Do so several times a day, especially when leaving the room. A good personal hygiene is essential. In some cases the use of antimicrobial soap is necessary. Severe mouth hygiene is very important too. In some cases, disinfecting mouth water is prescribed. The clothes you wear have to be clean, it is preferable to change them on a daily basis. In some cases, additional preventive measures are necessary. Ask your visitors not to use the toilet in your room, and not to go visit other patients. Inform your healthcare providers if you are a carrier of multi-resistant bacteria. Washing your hands with water and soap remains very important. Disinfecting them with alcohol based solution is no longer necessary. For your personal hygiene: wash yourself every day with normal soap. Wash your clothes at the highest possible temperature, using your usual detergent. The ideal washing temperature is 60°C. Ironing is a good way of killing pathogenic microbes as well. All dirty bandages and protection materials may be discarded with the domestic garbage. On admission to a hospital, tell the staff that you are/have been carrier of multi-resistant bacteria. How do I avoid an infection with a multi-resistant bacteria ? Practice Proper Hand Hygiene: The best prevention is simply washing your hands or using alcohol based solution to disinfect the hands – rub until your hands are dry. Spare the Antibiotics: Multi-resistant bacteria are a man-made problem, thanks in large part to the improper use of antibiotics. Don’t press your doctor to prescribe unnecessary antibiotics. Taking antibiotics when they are not necessary can cause harmful multi-resistant bacteria to grow. Shower power: Make sure to shower with soap after sports practices. Dry off with a clean towel and change into clean clothes. Be sure that your locker room uses soap dispensers and not bar soap where microbes could be spread. Cover your cuts: Pay attention to your skin. If you have a cut or scrape, clean it off with warm water and soap, and cover with a bandage until it heals. Keep it clean and dry, and if the area gets red, hot, or swollen, be sure to see your healthcare provider as it could be a sign that the area is infected. Don’t touch other people’s wounds or bandages. Arm yourself: Carry a small bottle of alcohol based solution for times when you don’t have access to soap and water.